While investing in green technology is good for the planet, there is serious money to be made in these emerging technologies. Let’s take a look at the economic impact of businesses and the government going green. Sustainability is now a permanent part of 70% of corporate agendas. Governments at all levels are getting in on the trend as well. Let’s look at how the federal government has invested in green technology and programs. Green goods and services accounted for 2.6 percent of total U.S. employment in 2011. Despite the recession in 2009, employment in most environmentally friendly sectors has increased recently. Sales of environmentally friendly products in the U.S. exceeded $40 billion last year. In a survey of energy efficient business leaders, 42% said their sales have increased. 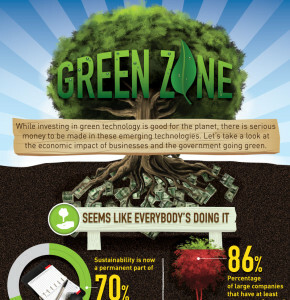 Which companies are standing out in their green efforts? In 2012 it received the European Union Code of Conduct for Data Centers Award, recognition for its long-term environmental efforts. IBM was one of the very first environmentally friendly companies. Volkswagen cars usually lead lists of the most eco-friendly vehicles thanks to the company’s efficient, eco-conscious cars, fueled by TDI clean diesel gas. Not only does Sony focus on being energy efficient, more than 20,000 employees have gathered food for the hungry, built homes for people who couldn’t afford it and cleaned polluted water resources. Samsung is dedicated to the greening of its management, products, processes, workplace and communities. Leaders also put a take-back and recycle program into place.